The lotus is a type of water lily. It grows in muddy, shallow water and rises to the surface of the water and blossoms into a beautiful flower with broad, beautiful, and colorful leaves. The flower may grow in murky waters, but it blooms into something quite breathtaking. Since the lotus is untouched by the impurity of the murky waters, it symbolizes the purity of both the heart and mind. Also, the seeds have been found to last for thousands of years and still able to grow! 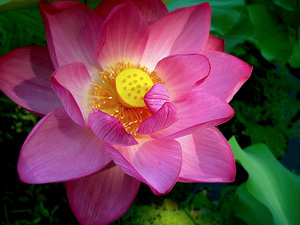 Thus, the lotus also symbolizes a strong life or vital force.